After spending centuries hidden in caves where they were accessible to no one, and decades on display in a Jerusalem museum where they were viewed by the few, the Dead Sea Scrolls arrived on the Internet today, where they can be seen by everyone. Using technology from Google, The Israel Museum in Jerusalem has created an online exhibit for the scrolls, which were discovered in the Judean Desert in 1947, where they'd been hidden in 11 caves since 68 BCE. The scrolls have been on exhibit at the museum since 1965. The exhibit is going live just in time to celebrate the beginning of the Jewish New Year, Rosh Hashanah, which starts at sunset on Wednesday. More than just pictures posted to the Web, the exhibit is interactive. 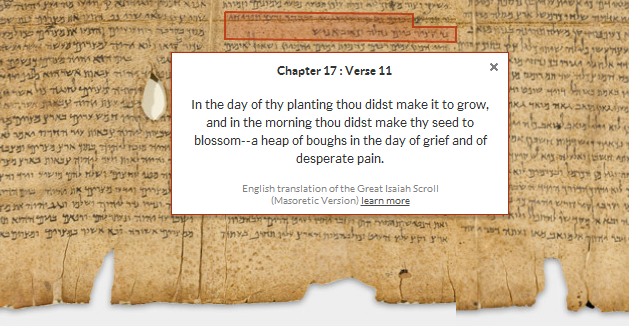 Not only can you zoom in and out on a scroll -- which is photographed at 1200 megapixels, almost 200 times the resolution of the average consumer digital camera -- but you can click on areas of Hebrew text in the scroll and get an English translation of it. Viewers may add comments regarding the documents that others can see and comment on, too. What's more, you can perform text searches on the scrolls. The Great Isaiah Scroll. One of the original seven scrolls discovered in 1947, it is also the most complete and the longest at 734 millimeters (28 inches). It contains the text of the Hebrew version of the Book of Isaiah, known for its description of the End of Days: "And they shall beat their swords into plowshares and their spears into pruning hooks: Nation shall not take up sword against nation; they shall never again know war." The War Scroll. Also one of the original seven scrolls, this document describes the final war at the End of Days between the "Sons of Light" and "Sons of Darkness." Commentary on Habakkuk Scroll. Another of the seven found in the caves of Qumran in 1947, this scroll discusses religious politics of the day and the arrival of the Romans on the scene. No historical figures are mentioned by name, but there are allusions to characters such as the Teacher of Righteousness,"the Wicked Priest," "the Man of Lies," and others, whose identities haven't been determined. The Temple Scroll. Discovered in 1956, this scroll is written on the thinnest of parchments -- 0.10 millimeter thick -- and purportedly provides the details of God's instructions to Moses regarding the construction and operation of the Temple. The Community Rule Scroll. This is a sectarian document, also part of the 1947 find, that sets down community rules such as admission of new members and conduct at community meals. 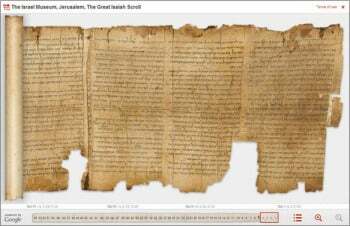 The Dead Sea Scroll project is part of a larger effort by Google to bring important cultural and historical collections to the Web, according to Eyal Miller, of Google New Business Development, and Eyal Fink, a software engineer at the Israel Research and Development Center. Other similar projects Google has participated in include the Yad Vashem Holocaust photo collection and collections at the Prado Museum in Spain. "We are thrilled to have been able to help this project through hosting on Google Storage and App Engine, helping design the web experience and making it searchable and accessible to the world," Miller and Fink wrote in a Google blog. Google technology provides similar access to exhibits at the J. Paul Getty Museum in Los Angeles.